This arts and crafts bed is a fantastic addition to our large range of antique oak and mahogany beds. 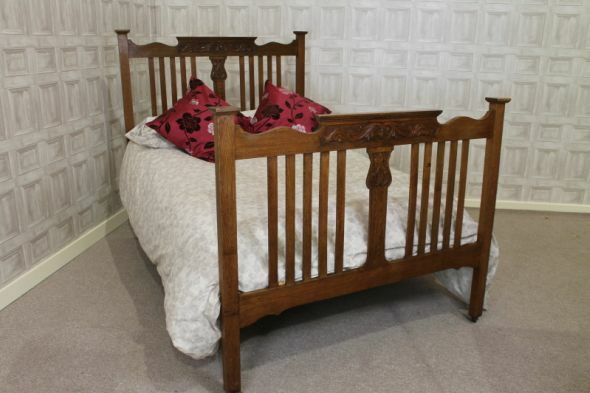 This beautifully arts and crafts inspired circa 1900 double bed features an ornately carved headboard and footboard. This arts and crafts bed is in a beautiful golden oak colour, and is in outstanding condition for its age. It comes complete with a newly made pine bed base so all that is required is a standard double mattress. A beautiful piece of arts and crafts bedroom furniture, ideal for any period bedroom setting.